GO:KEYS, the new Music Creation Keyboard GO-61K from Roland allows newcomers to start playing and enjoying music straight away. 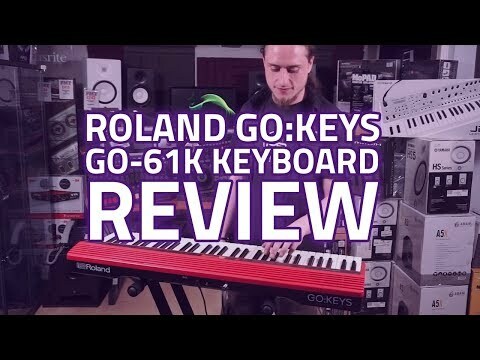 Roland GO:KE..
GO:KEYS, the new Music Creation Keyboard GO-61K from Roland allows newcomers to start playing and enjoying music straight away. GO:KEYS is an easy-to-use and extremely fun keyboard that allows you to play along to your favourite music via wireless streaming through its powerful built-in speakers. Easy to Play – No Experience Required! It doesn’t matter if you’ve never even played keyboard before; anybody can have fun and start creating great music straight away by using the unique Loop Mix function found in GO:KEYS. While other keyboards require you to have knowledge of chords, the GO:KEYS GO-61K keyboard has Loop Mix which offers up an entirely new approach to playing with accompaniment and it’s something that even keyboard beginners can get on board with. A series of performance pads allow you to manipulate your songs by adjusting pitch, using filters and more. Another really great feature that sets this 61 key keyboard apart from the rest is its Bluetooth connectivity. Simply connect your smartphone, tablet or other Bluetooth device to the Roland GO:KEYS keyboard, choose a song and play along! When you’re ready to move on to more advanced music production you can use GO:KEYS for MIDI recording with some great apps such as GarageBand and others. What’s more; the speaker quality and power on the GO:KEYS far surpasses those found in most Bluetooth speakers so you can use it as a great way to just enjoy some of your favourite songs wirelessly. GO:KEYS has been designed to be immediately accessible to newcomers but provide professional quality sounds that players of all levels will enjoy and appreciate. Over 500 ready-to-play sounds are built-in, derived from Roland’s acclaimed pro synthesizers. Category buttons make it easy to navigate to the sounds you want, sorting them by pianos, synths, strings brass and many other types. Thanks to the compact, lightweight design and powerful built-in speakers, you can take GO:KEYS with you and enjoy performing and listening to music pretty much anywhere. Of course, you can plug GO:KEYS into the mains with the included AC adaptor which is great when you want to play in your room or around the house. When you want to go out on the road you can just put in six AA batteries and take it wherever you want – perfect for playing in the garden, at BBQs and on camping trips. By plugging in headphones, you automatically mute the speakers so you can enjoy your music privately, listening to your favourite tunes or just practicing your own performance, without bothering anybody around you.